This week ended up being interesting with winter precipitation and very cold temperatures in play. Monday evening into Tuesday morning, we received a bit of snow and then lots of sleet. Needless to say, life was affected! I ended up working from home on Tuesday and Wednesday and did not leave the house at all. This southern girl does not drive on ice! Training wise, I can do alot of things at home, but swimming is not one of them! I was able to knock out 6.75 miles on this run. With one of my goals focused on a faster run, these tempo sessions are going to really gain extra importance. This was a smart session in that I had a good solid effort. Maybe even a bit better than what I thought I could do at this point. W/U: 10-minute easy spin followed by 4×30-second one-legged drills, focusing on smooth circles. Main set: 2×10 minutes beginning at 60 RPM and increasing RPM by 5 every 1 minute to max out at 105. No rest between sets. 4×5 minutes with cadence for odd intervals being 95 and even is 70. 2-minute rest between intervals. C/D: 10 minutes easy spinning. This will be a regular workout in my plan. It was a staple from my IM training plan and I find it very effective. It is easy to increase the total time by throwing in an additional 10 minute working set in the main set. I especially like it because the time seems to pass quickly during this workout. Here in Raleigh, the HIGH temperature was in the teens. I know for some of you throughout the country, that is not too bad. But for us here in NC, that is COLD! I knew I had to get in a swim though, since I had been home bound earlier in the week. 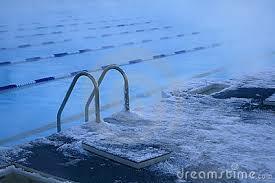 Generally, I hate swimming during the winter because I don’t like the cold. But, I just do it because I need to. 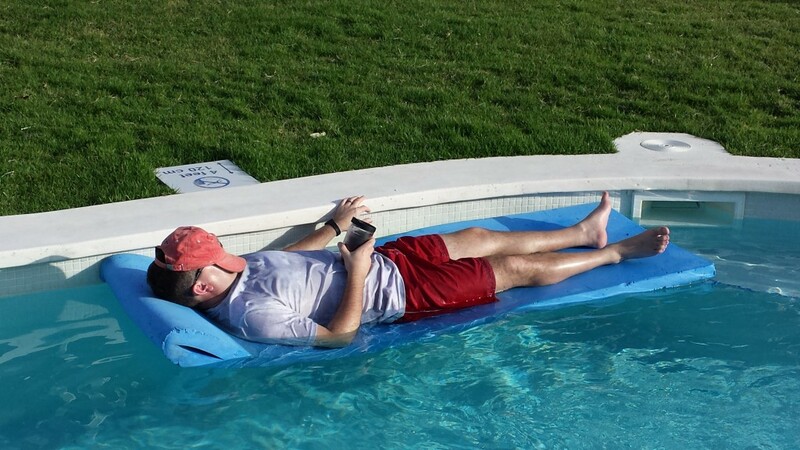 So, getting to pool when it was roughly 17 degrees outside (and was getting colder and colder) was harder than normal. After I changed and got to the pool deck, ugh!!!!!!!! Man, it was cold. 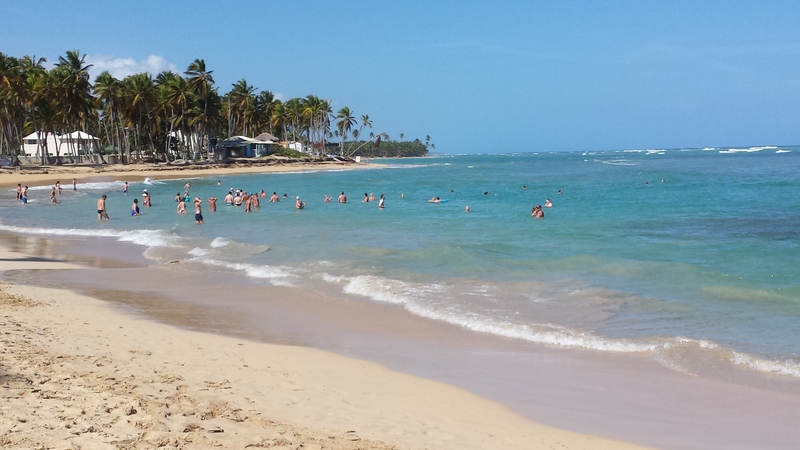 I could not believe I was standing here in a bathing suit ready to get in the water. Well, the first 25 yards was much faster than normal. I just had to start getting warm! Luckily, I had planned a speed workout for the day. 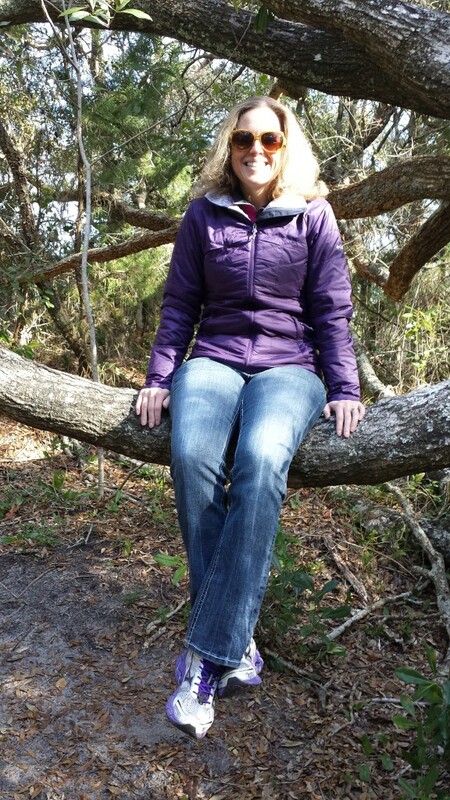 That ended up being perfect since I was able to keep my body warm and had very short rest intervals at the wall. Main set: 8x (100 moderate/:15sec rest/50 FAST), :30 sec rest between intervals. I was so glad to get this workout done and get in the HOT shower. I was proud of myself that I did not succumb to the extreme desire to go home and not go to the pool on this cold evening. However, I unfortunately have not made any improvement in my times over the past two weeks, as this was a repeat session. 4.5 mile run on the treadmill with the focus on speed intervals. This workout was definitely a tough one. I had to keep my focus to get through all 5 speed sets at the pace I wanted to maintain. I was glad that I was able to do just that! 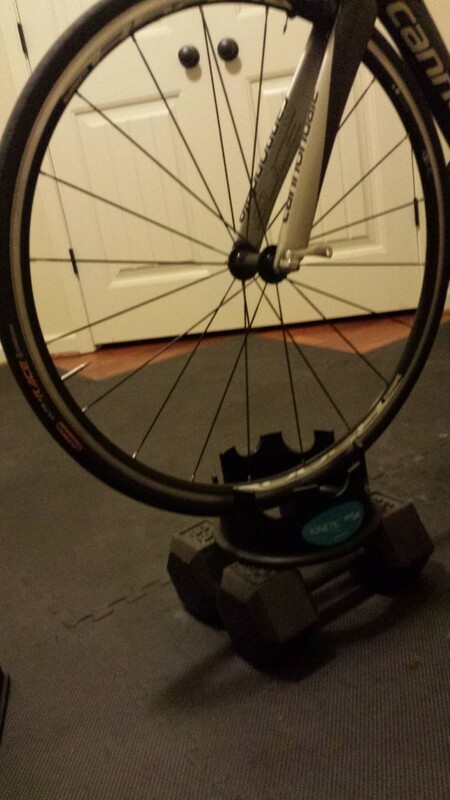 1 hour on the bike trainer – For this workout, I wanted to mix it up a bit. I knew I needed something with a good amount of intensity, so the plan was to follow a trainer DVD. We have a pretty good collection of various spin workout DVDs and I decided to follow the “CTS Train Right Time Trial” DVD. This session focuses on lots of high cadence work. It gives a BIG bang for the buck! I worked hard and it was great! 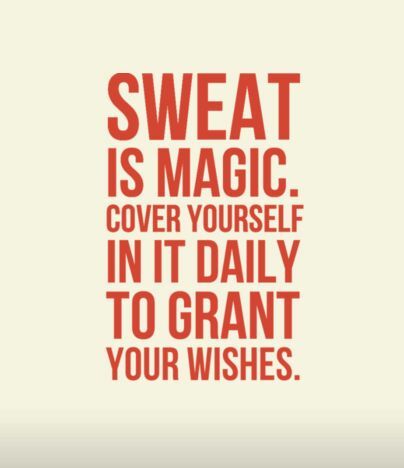 It was always a great feeling when you get done with a workout and you know you didn’t hold back! The pool was fairly quiet this Sunday afternoon as I worked in a swim that I missed due to rearranging my schedule because of the inclement weather. I had some juggling to do this week with my schedule since I had a couple of evening events during the week. I ended up with three early morning, pre-work training sessions. I will always incorporate early mornings when I have to, but prefer the after work time period to waking up with the chickens! 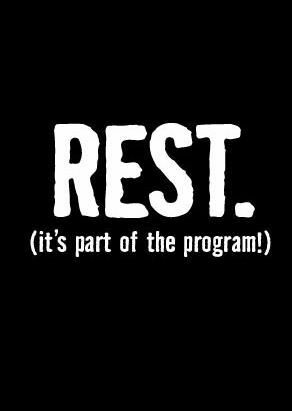 I was able to take the full rest day on Friday, which is uber important in my training. Main set: 3×10 minutes steady swim. 1-minute rest between intervals. The decent feeling I had about my swims from last week was kind of deflated with this swim. The longer sets have definitely suffered from my time away from the pool. It reaffirms that I need to spend quality time on my swim! With family plans in the evening, I got in an early morning session of yoga and abs. It is always good to fit this in! Long easy run on the treadmill. My goal was to get in an hour with an “easy” effort. I got in 6.19 miles during my run. I was not concentrating on my pace, jut my heart rate. I wanted to keep it in the desired range, so that dictated my pace. I needed this longer rest set between the 300s than I originally planned. I was trying to maintain a strong moderate pace throughout and it was a tough swim. 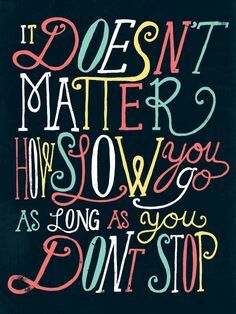 I am still struggling with my swim paces this week, so I will do what I always do…just continue to do my best. 45 minutes on the bike trainer with the focus on hill repeats. W/U: 10-minute easy spin with 3x30sec accelerations toward the end of warm-up. Main set: 2×10-minute hill repeats. Remained seated throughout entire climb on first climb (@ 60-65 cadence) and alternated between sitting/standing every 30-seconds on second climb (@ 55 cadence). 5-minute recovery between repeats. I find the hill repeats on the bike to be effective. Does anyone else simulate hills on the trainer? 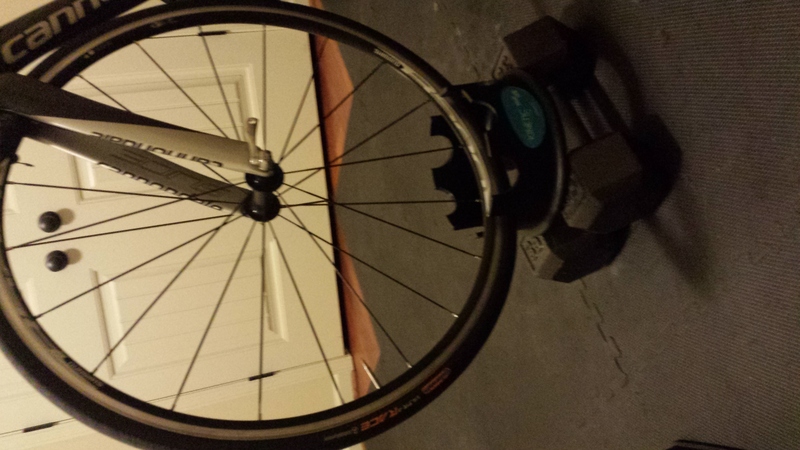 Not sure how everyone else mimics hills on the trainer, but this is my front wheel set up to work the hills. 4.86 mile run. 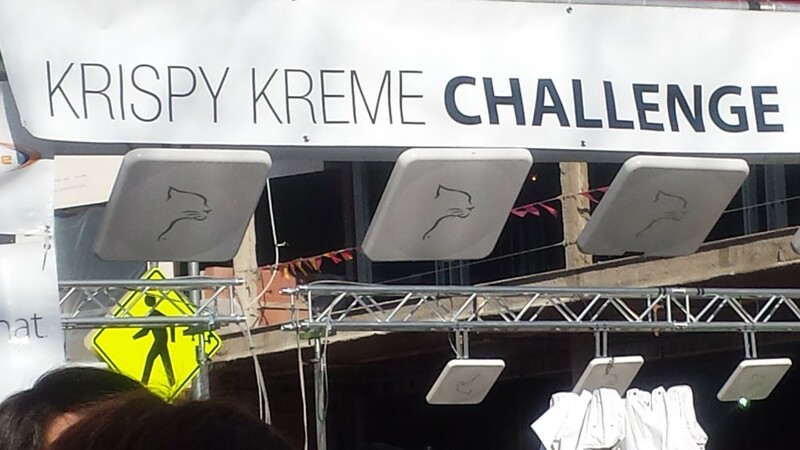 This was the Krispy Kreme Challenge I wrote about earlier in the week. 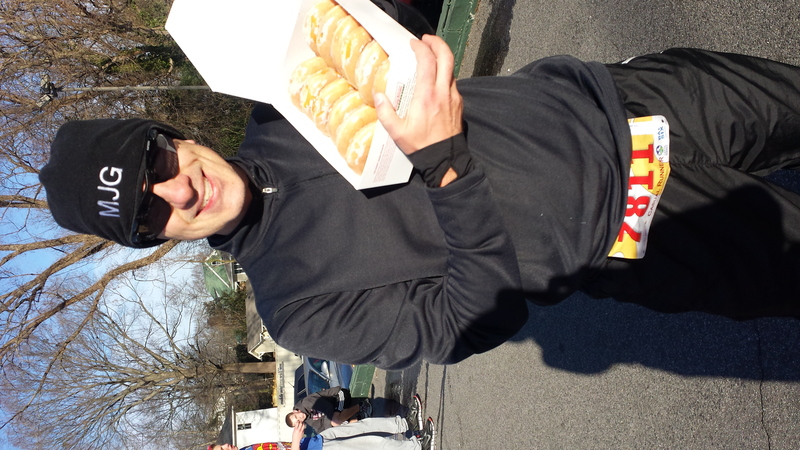 Doughnuts will not be a repeated choice for my run nutrition in the future:)! C/D: 10 minutes easy spin. This was a solid bike session where the time passed relatively quickly. Trainer time is quality time!! 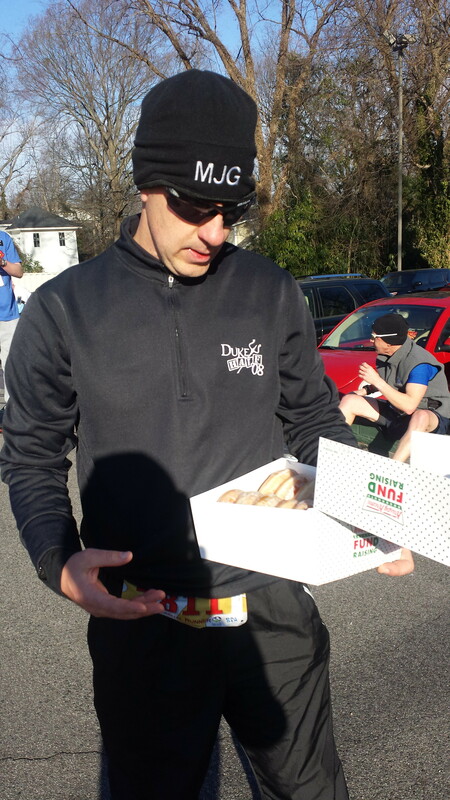 If you have ever read Runner’s World list of their favorite crazy races, then you might have heard of the Krispy Kreme Challenge. It has also been included as #85 on the “102 More Things You Gotta Do Before You Graduate” by Sports Illustrated. 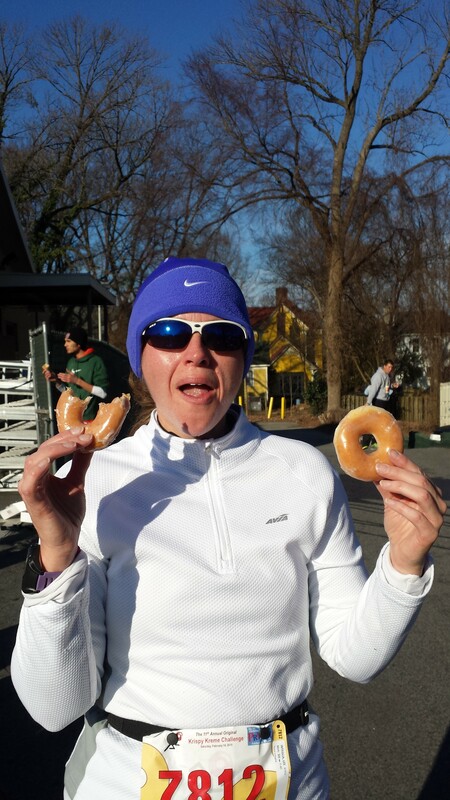 So, what is the Krispy Kreme Challenge? (The following race description is from the event website). 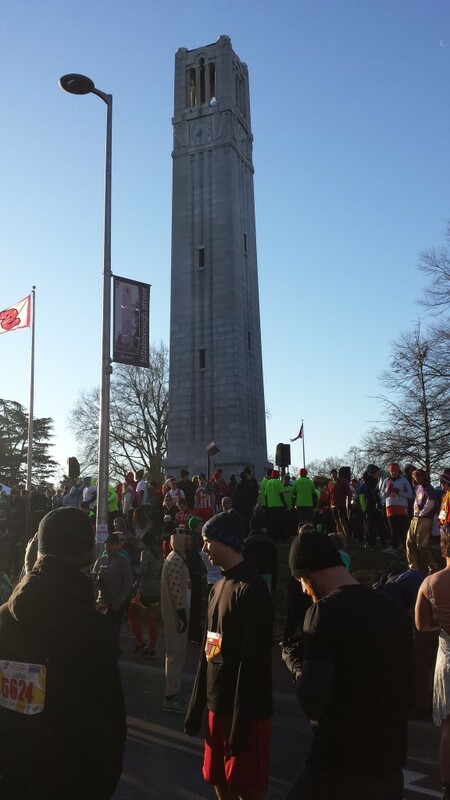 Participants begin the Challenge at the Memorial Belltower on the campus of North Carolina State University in Raleigh, NC. 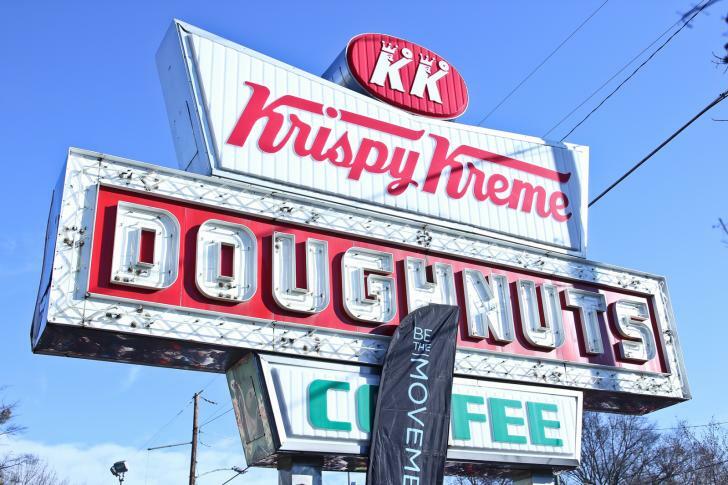 Runners then travel 2.5 miles through historic downtown Raleigh to the Krispy Kreme located at the intersection of Peace and Person Streets, where they attempt to consume one dozen original glazed doughnuts. 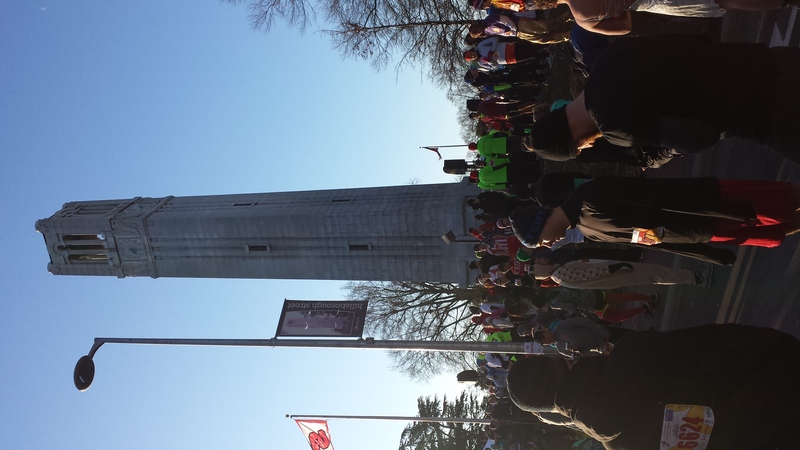 The hardest part of the Challenge awaits them as they run 2.5 miles back to the Memorial Belltower. 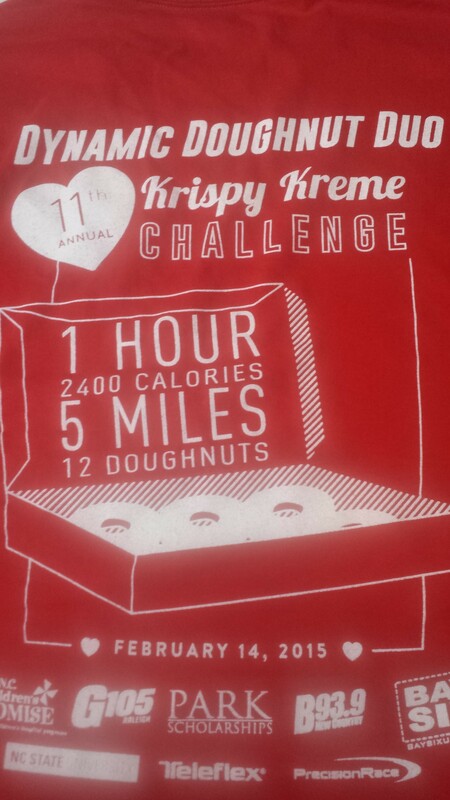 This is the Krispy Kreme Challenge. 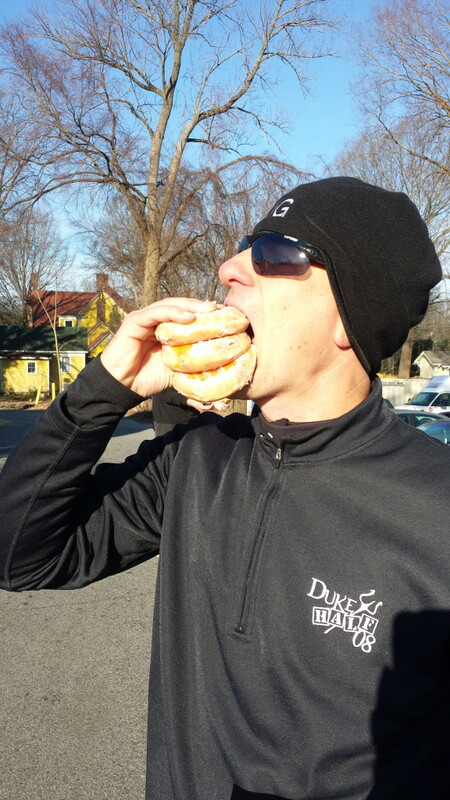 The Krispy Kreme Challenge started in December 2004 as a dare between a few NC State undergraduate students. 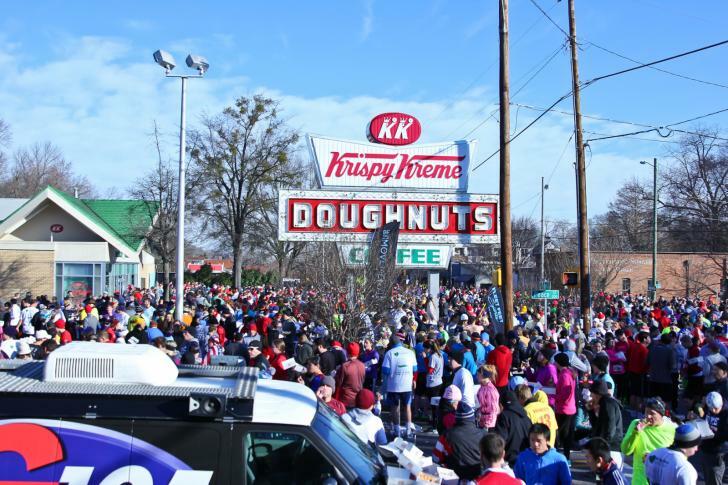 Organizers decided to publicize the Krispy Kreme Challenge and turn it into something that would not only be an event to bring together people from all over the country but also to benefit an important cause along the way. This event is held annually, with 2015 marking the 11th running of the event. With this craziness being held in our city, Tony and I have always talked about participating one year. We decided that this year would be the year. With it falling on Valentine’s Day, we figured it would be a fun way to start the day:) This year they included a new “race” category, called the Dynamic Doughnut Duo. This is in addition to the challenger category (the category for runners who are truly taking the challenge and can claim victory by eating all twelve doughnuts and completing the race in under one hour) and the casual category (for runners who are taking a less serious approach to the event and eat as many or as few doughnuts as they wish). The Dynamic Doughnut Duo is for a couple to register together and share one dozen. 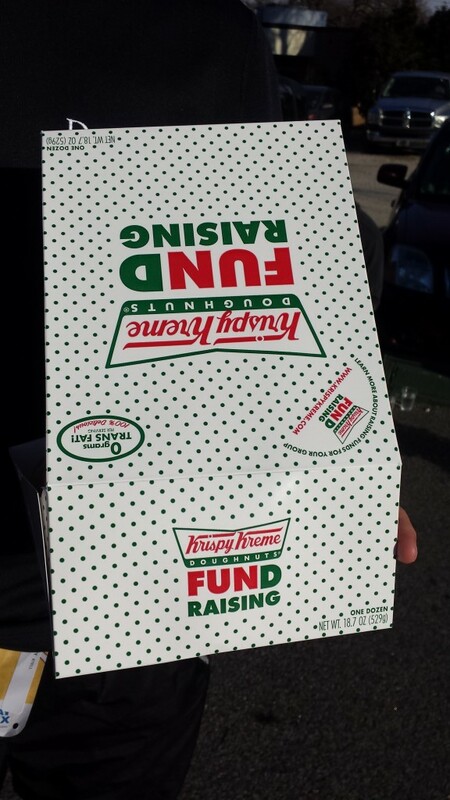 We never intended to eat a full dozen, we just wanted to go out a have fun and support a great cause, the NC Children’s Hospital. It was a cold, but sunny morning, so we layered up for the 8:30 am start. As always, there was a great turn out for the event. I was not as cold as I anticipated having to wait around for the start. 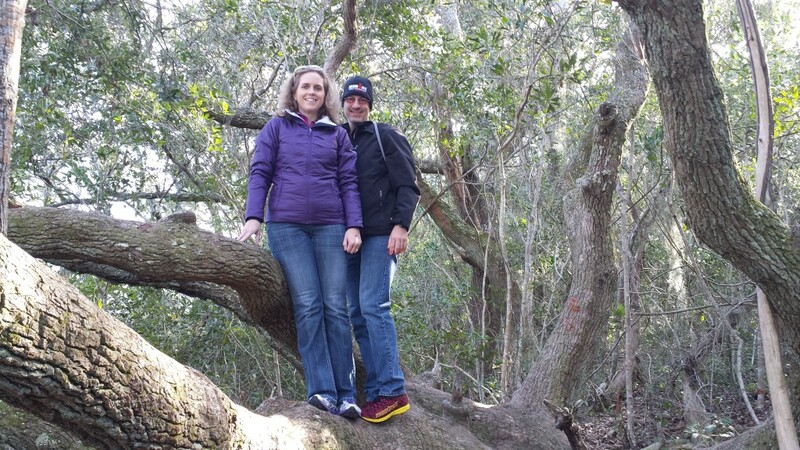 It was definitely brisk, with temperatures in the low 20s, but we stood in the sun as much as possible. Tony and I ran together, with him matching my pace. I wanted the first half to be at a decent tempo pace for me, since I was not sure what to expect post-doughnuts. We made it to the Krispy Kreme around 8:53 (I know this due to the time stamp from the first photo I took there). There were people everywhere with their doughnuts…some eating leisurely and some tackling the dozen. We knew that we would never try to eat the dozen…I love KK doughnuts too much to never want to eat them again. I had decided I would eat two. I wanted to eat some, to take part in the fun nature of the event, and thought anything more than that would make for a hugely miserable 2.5 miles to the finish line. It has been ages since I have had a KK doughnut, so they really tasted great! (For anyone that knows KK doughnuts…they are absolutely perfect when the “hot now” sign is on…nothing like that today, but always good to me). No way we are eating all those!! While Tony’s picture shows a very strong start, he ate about 1.5 total. His eyes were bigger than his stomach! We started back and quickly passed a spectator offering bacon to the runners (something “salty to cut the sweet”). Since bacon is one of Tony’s favorite foods, he sampled and really enjoyed it! I started to feel my sweet treats about 1/2 mile later. 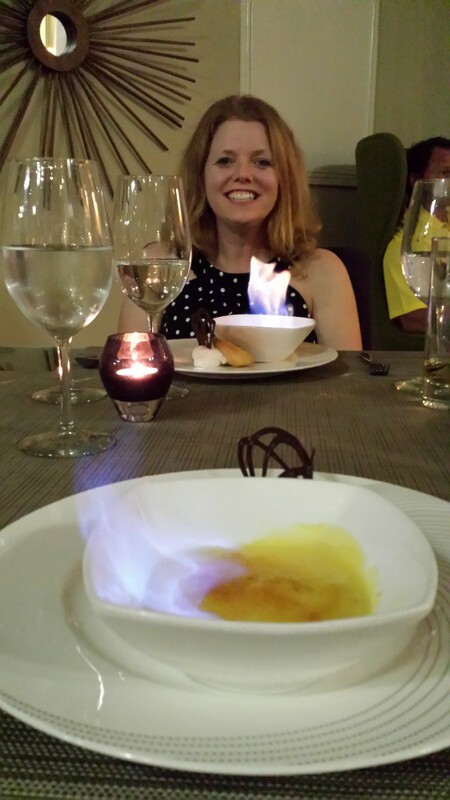 My stomach was definitely wondering what the heck was I doing…this was not typical run nutrition that I had taken! There was one particular hill that really did not support the combo of doughnuts and running, but it seemed that after I got passed that, the worst was over. After we crossed the finish line we quickly saw evidence of what happens to some with this brutal combination (hint: watch where you step!!). Luckily, Tony and I were feeling ok.
Our official race time was 48:28 which includes us stopping to have the doughnuts and photo fun. My Garmin showed a total of 43:56 and 4.86 miles. My mile paces were as follows: 8:44 / 8:41 / 9:23 / 9:07 / 9:22. We actually finished in the Dynamic Doughnut Duo category in 44 and 45th places out of 1134 finishers in the category! There were 2256 finishers in the challenger category and 2597 in the casual category. My scientific conclusion is that there is definitely an impact to one’s running pace after the consumption of doughnuts!!! 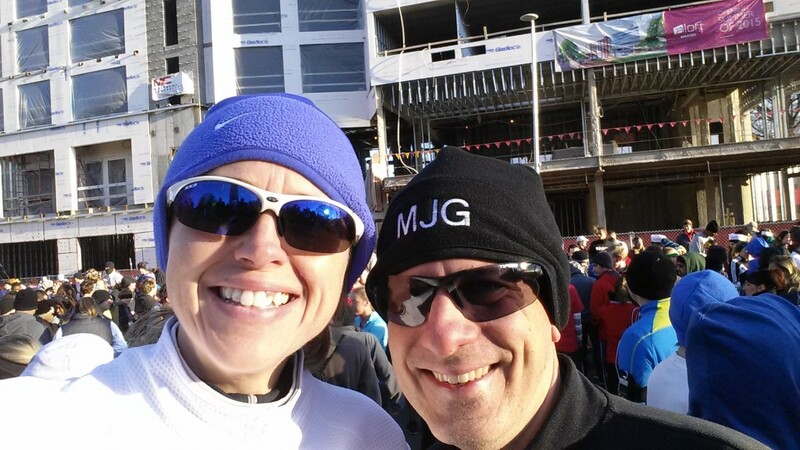 This was one race that I don’t plan to repeat, but I am glad that we participated once and got to experience a bit of the craziness that is the Krispy Kreme Challenge! More importantly, this year’s event resulted in a donation of $195,000 to the NC Children’s Hospital bringing the eleven year total to $953,000. Having fun a supporting a great cause! Good job NC State!! This was my first week back to a training plan. Ever since last summer after completing IMLP, I have been using the “no plan” training route and while I have been fitting regular sessions (5 to 6/week), it has been more of a variety with no particular goal or race in mind. I did enjoy that time, but I am ready to get a bit more structure with some specific goals in mind. This was a work-out from my IM plan that I decided to incorporate. I always liked this session because the time seemed to pass quickly with the one minute changes in the initial main set. I felt good during this workout and I liked bringing back something from last year’s plan. I did not push too hard, but was pleasantly surprised that my times were not as slow as I expected. I had put in a few swims in just the last couple of weeks to try to start working out some of the cobwebs before the plan kicked in. 4 mile tempo run on the treadmill. My goal was to maintain an average pace of 8:30 and that is exactly what I did. I felt pretty good on the run; definitely tough to maintain my pace, but I was able to complete as planned. 45 minutes on the bike trainer. This was another workout from my IM plan that I decided to incorporate. There were some solid sessions in that plan, so I plan to frequent several of them. 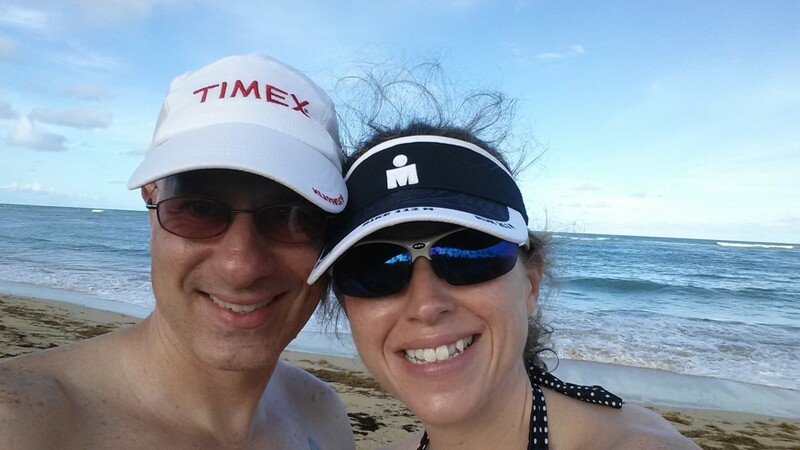 I planned to do 1-hour yoga that is offered by Trilife, a great local triathlon shop. I got there, checked out their new store location and chatted with the owner a bit. I changed and was ready for yoga, but the instructor never arrived. Apparently there was a miscommunication, so no yoga. Oh well, after chatting some more I then headed home. At least I had gotten in a morning training session! This was originally planned to be my rest day. However, with a beautiful weekend in the weather forecast, I was thinking that the swim planned for Sunday would turn into an outdoor ride, so I opted to get in the swim Friday instead. Wow! I have not done speed work in the pool since last summer! I was not aiming to push too hard with this workout, hence the 50 sets for speed. However, I found that I was pushing my 100 pace a bit over “moderate”, but it felt good. I was feeling the fatigue about mid way through, but I was able to hold a fairly consistent pace of 1:52-1:54 for the 100s and :53-:55 for the 50s. This was another workout from my IM plan that I had done early on. I was able to compare my times to last February when I first swam it. I am probably “about” 4 seconds off that pace. However, I swam consistently all the winter prior to that, so overall, I feel ok about where I am currently. We had a day full of plans, so I got up early and jumped on the treadmill before we headed out for the day. I completed a 6-mile run at target race pace. My goal was to average just below 9:00/mile pace and I actually averaged 8:56, so I was pleased. My legs were happy when I hit the 6 mile mark, because they were definitely feeling a week’s worth of training. 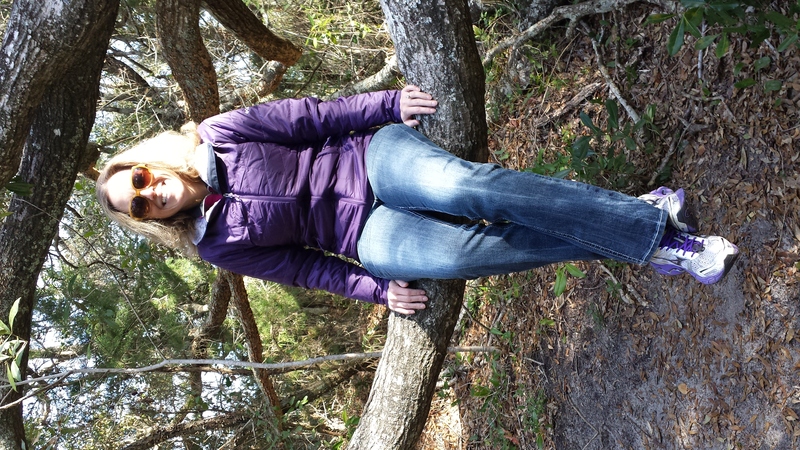 I have included a few fun photos from our day trip to Beaufort, NC, which is located in the eastern part of NC. We had a great day! As I mentioned earlier, the forecast was for a warm February day (sorry to you all that are surrounded by snow), so I planned to ride with my bike friend Susanne. We rode a 30 mile route and battled some VERY windy conditions, but it is hard to complain since the temperature was in the low 70s on February 8! It was a great feeling to be out on the road riding. Spring can’t come soon enough! Lately my life has gone from one extreme to another. This post focuses on the one that I enjoyed the most!! 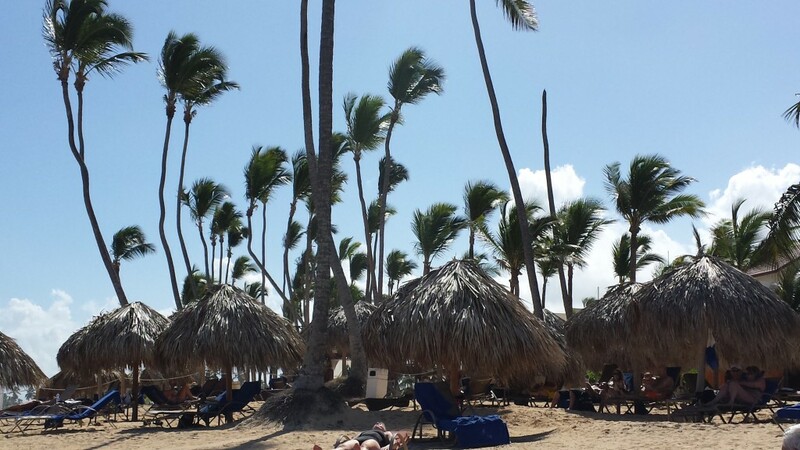 In mid-January, we headed down to Punta Cana in the Dominican Republic for some fun in the sun! 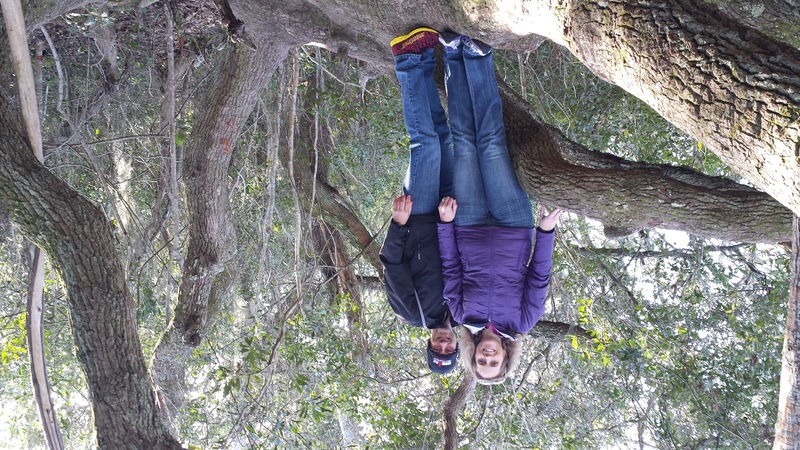 We had a super relaxing trip. The flip side to the story was that after arriving back for vacation, life became incredibly busy, especially on the work front, due to a pressing deadline. However, I made it through all the craziness! Life should be a bit more “normal” for the foreseeable future. 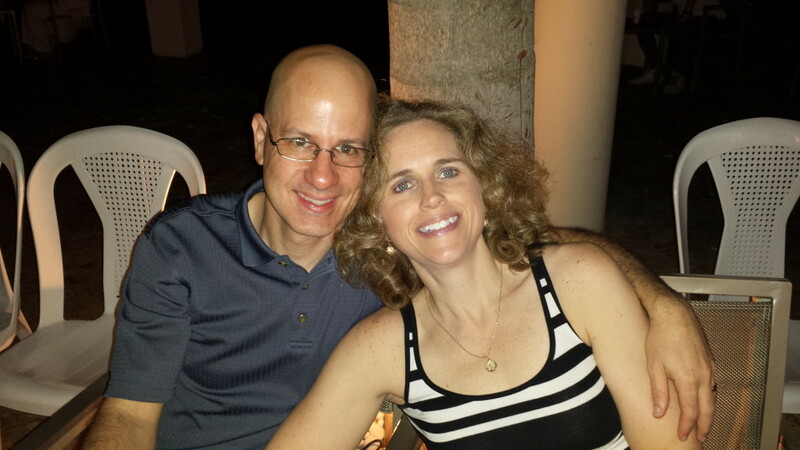 So back to vacation talk…we traveled with one of our closest couple friends, Kelly and Sean, for our week long get-away. 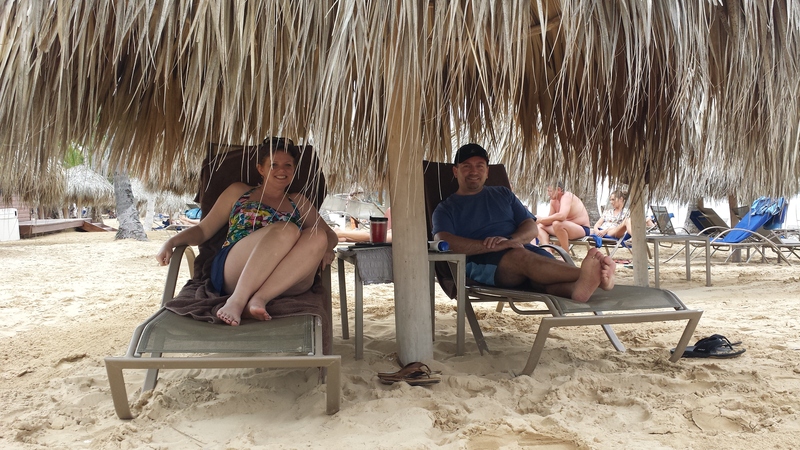 We selected an all-inclusive resort where we could focus on extreme down time or select activities if we chose to leave our lounge chairs. 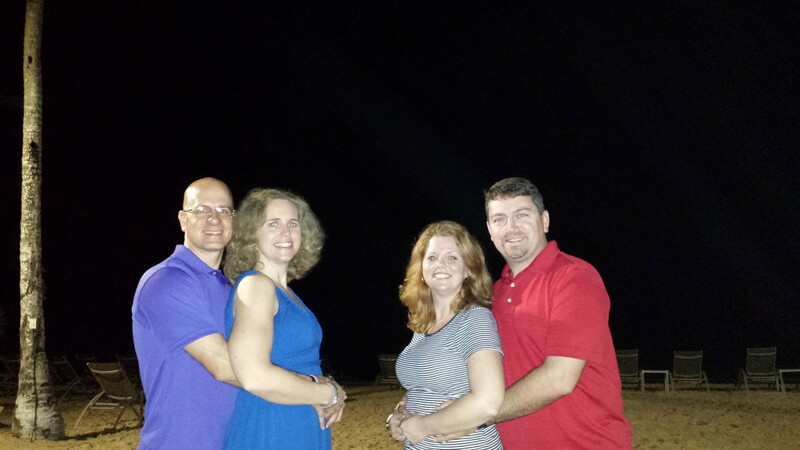 We did not plan any off resort activities before we traveled. 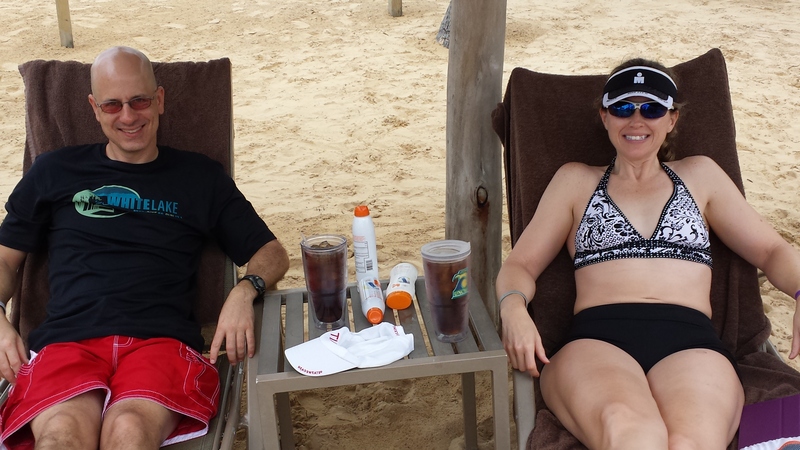 We went with the mind set that if we decided to try something, we would…otherwise, resort time was the plan! I wanted to share a few of the highlights through some fun photos! 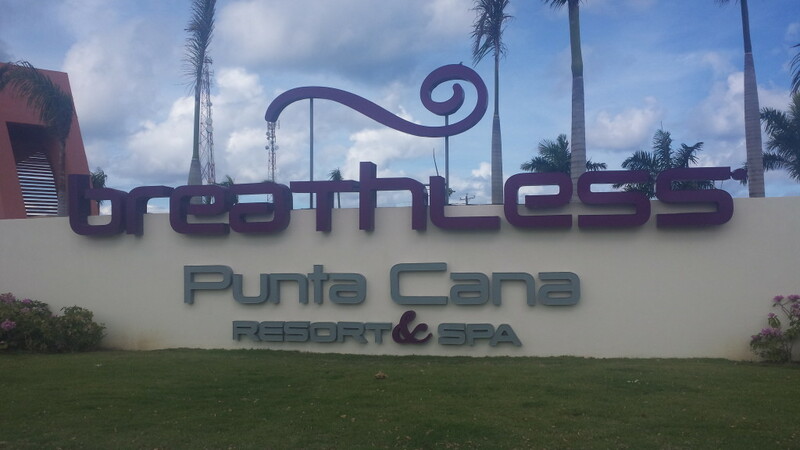 Our home for seven days! Waiting for an evening show to begin! We enjoyed lots of beach time! 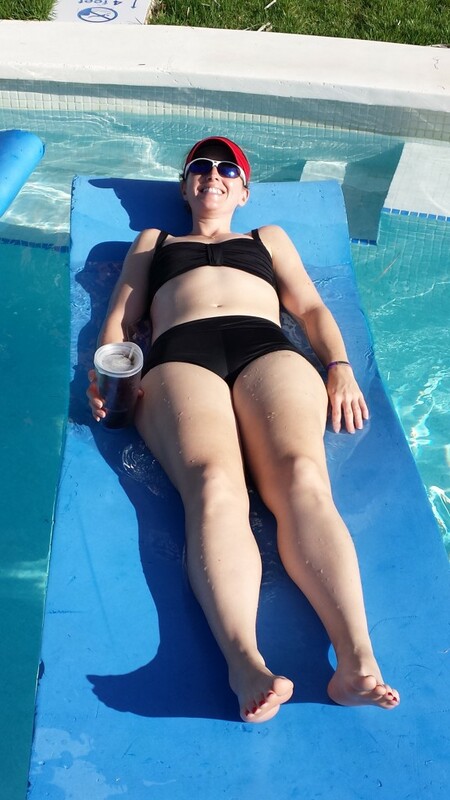 And lounging at the pool! Tony enjoying some time in the shade! Sean with some raft time! Rafts were a fun past time during the week. Enjoying another post-dinner evening show. 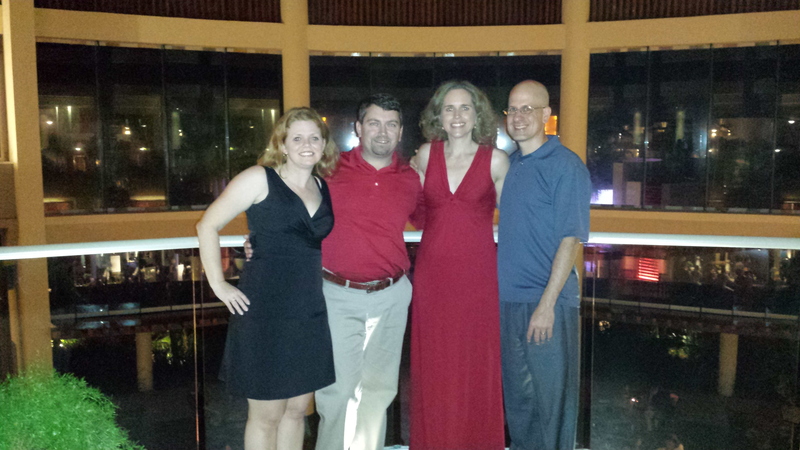 We had lots of beautiful nights! 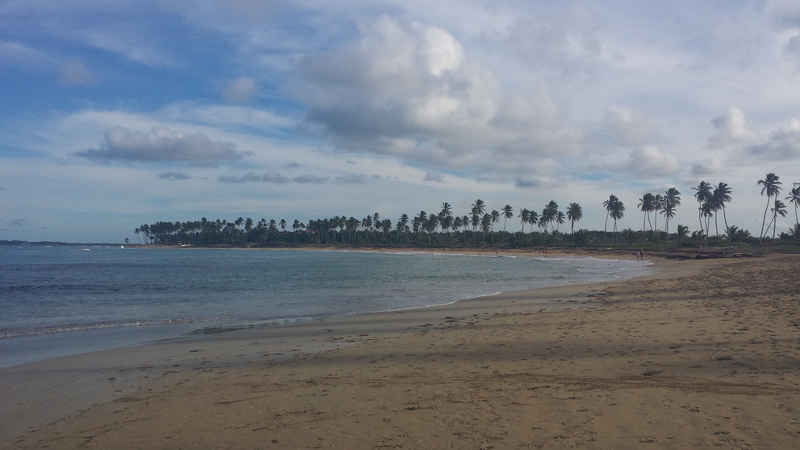 An evening stroll on the beach. 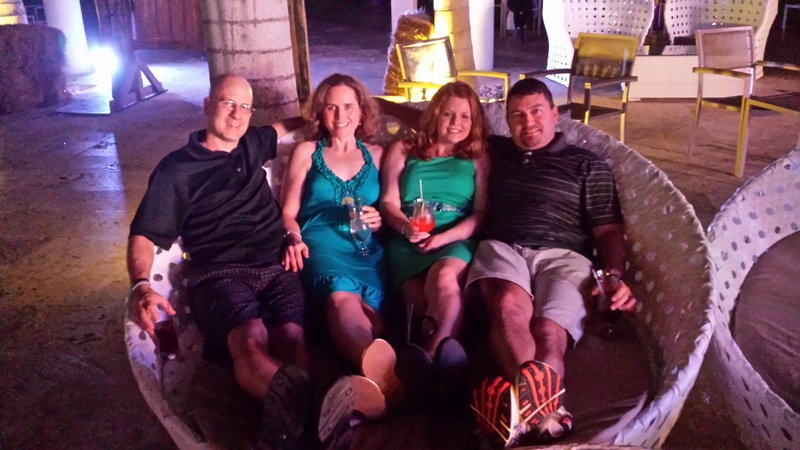 Great friends on an awesome vacation! Looking at this and remembering the cold weather that is at home! 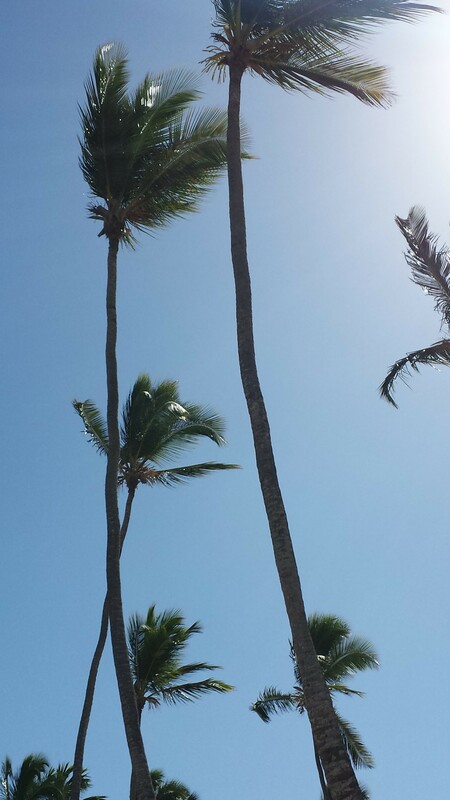 The palm trees are so relaxing to look at. 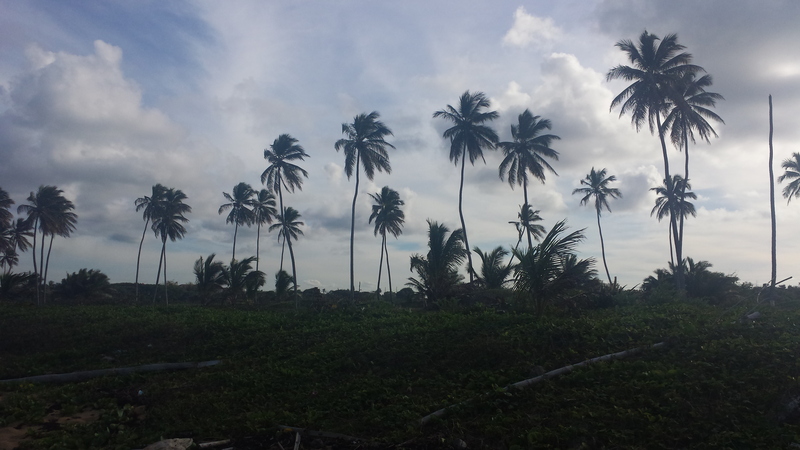 A nice afternoon walk on the beach. 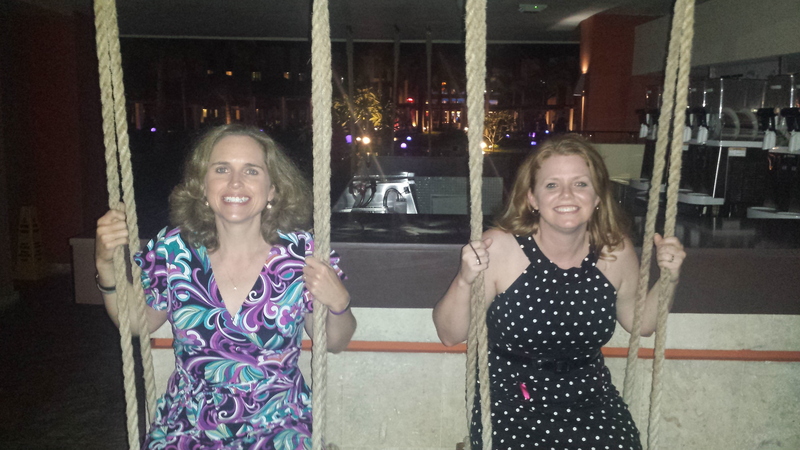 Our last evening and finally enjoyed the swings at one of the pool bars. Fun! Apart from a short shopping trip a few blocks away from the resort, we ended up not choosing any off property activities during our stay. We did however, begin each day with quality time at the on-site gym. 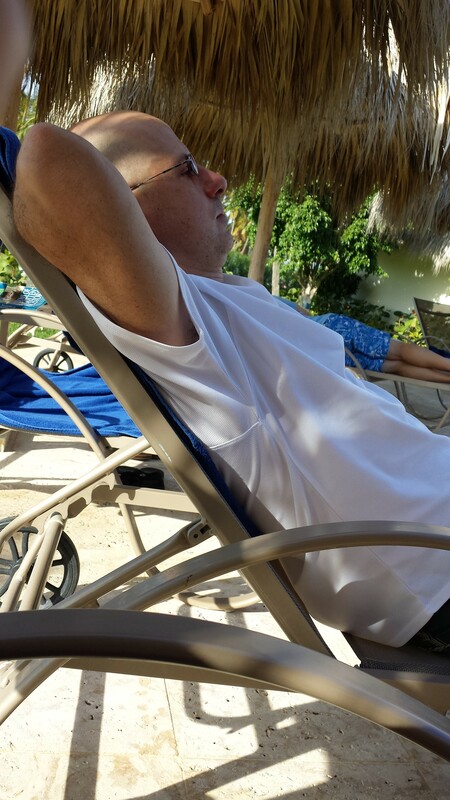 I was able to get in a good workout each day, which was needed to offset (albeit only a little) the eating and drinking we were enjoying at the all-inclusive! It was a great trip and I thoroughly enjoyed all the rest, relaxation and great times spent with my hubby and good friends! 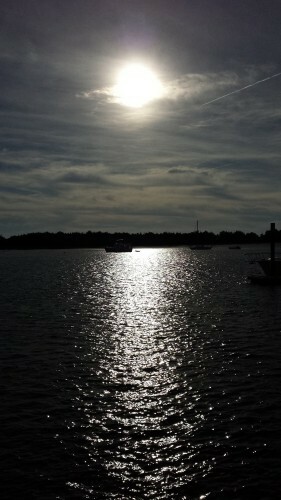 The sun and warm temperatures were a dream and a welcome treat since leaving icy and cold conditions at home. 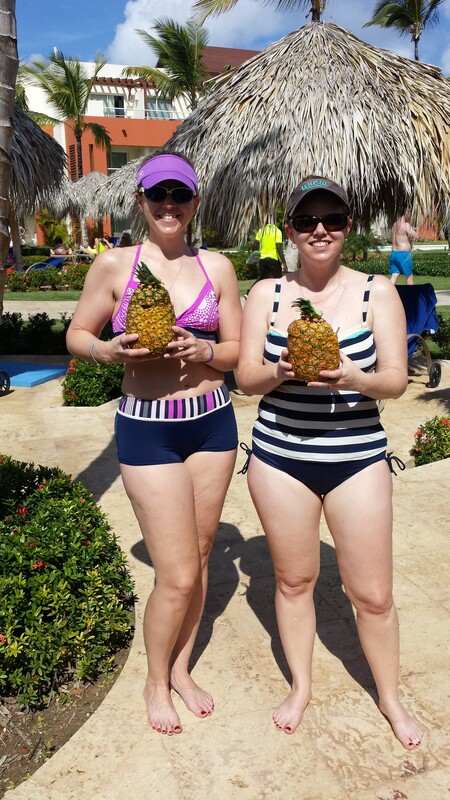 This was the first winter tropical vacation we have taken and I highly recommend it! As I mentioned earlier, life is back to normal. Actually, I start my official training plan for Raleigh 70.3 yesterday. It has been months since I have had a plan to follow and while I have enjoyed my “no plan” training, it will be nice to get back to that structure. Stay tuned for updates!